It takes no time at all to crochet a cowl or a scarf, and some of these are super-fast, using chunky yarns and a big hook. Nicki Trench has created a wide range of contemporary designs, with a variety of stitches and fashionable colours, so you’ll really stand out from the crowd. Start with the soft and cosy pom pom scarf or the bright shell stitch scarf in red, yellow and peach. Not every scarf or cowl has to just be for winter! The pretty silk lace scarf and the cool Mexican-inspired tasselled scarf can be worn all year round. 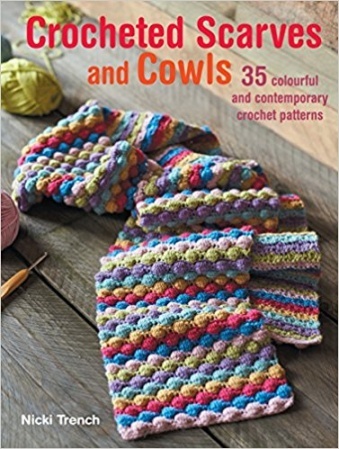 There are also handy stash-busters such as the patchwork scarf and the horizontal striped cowl. Whether you want to match your scarf to your outfit or give them as gifts, there’s something for everyone in Crocheted Scarves and Cowls.